Enjoy the picturesque sights and a comfortable home four seasons a year with a furnace or air conditioner rental in North Bay. When it comes to your HVAC (Heating Venting Air Conditioning) system there is often little warning and even less time to act when it starts to malfunction. In Ontario, with our summers getting warmer and warmer a lack of central air conditioning can be more than uncomfortable; it can be dangerous. Heat waves can cause negative health effects on those in the vulnerable sector. The elderly, young children and those with medical conditions that can inhibit breathing can face serious medical risks. When heating systems fail, it can quickly turn serious. In a time when you are faced with a large financial investment in your home, there is often not the time available to fully research and feel comfortable with the company or brand you are choosing for your home. In addition, many property owners are faced with choosing lower quality brands or budget companies in order to try and save money. Luckily for North Bay residents, there is now a better and more affordable option, without compromising quality. By choosing to rent your unit, you are choosing to make the best investment you can in your home. When you choose a rental, you don’t have to compromise quality for price. We only use the best brands like Amana, Lennox and Goodman. We only use professional HVAC technicians and we stand by our products for the lifetime of your agreement. By choosing a rental agreement over a traditional financing option you are taking the pressure off that comes with paying the entire amount of your system(s) up front or even coming up with a large down payment. By offering a brand new system without any money upfront, you are able to get your system installed as soon as possible, often as early as the next day. Installation is done by a professional HVAC technician. We offer installation of your furnace or air conditioner at no cost to you and we even offer complimentary removal of your old unit. As you are a property owner you have a good chance to be approved. Although rental agreements are a great resource for home owners, they are also a popular choice for business owners and landlords as well. Not only are they a great way to invest in your property with no upfront costs, but their low monthly payments are an easy way to keep a predictable monthly budget. Rental agreements also can offer something that traditional financing cannot do. We will offer you protection for your system as long as you have an agreement with us. This coverage includes your system maintenance. Once a year a licensed professional will come to your home to inspect and update your unit to ensure that it is working as efficiently as possible. Having an efficient system means you are not overpaying on your energy bills. We also offer an emergency line exclusively for our customers to contact us in the event of a system malfunction. One phone call gets you expedited service to your property. We will fix the issue or replace your unit at absolutely no cost to you. Just a quick three and a half hour drive north of Toronto, North Bay is a popular spot for visitors all year round. Home to one of Ontario’s largest lakes, Lake Nipissing, people are drawn for its four season fishing, sandbars, and Manitou Islands. Visitors can choose to rent a boat and explore Nipissing’s beauty on their own or join the 320 passenger twin hull vessel designed specifically for touring the northern waters. Residents are able to stay active all year long with access to 1000 km of trails for walking, running, biking and inline skating. These trails are well maintained with access to breathtaking northern Ontario views as well as access to downtown. When the mercury dips residents and visitors know there is no reason to retreat indoors. Instead, they can take advantage of skiing, snowshoeing and it’s the destination for Ontario Federation of Snowmobiles Club 412 km Ride around Nipissing (RAN) Snow tour. Along with the picturesque sights and well maintained trails, the tour offers a chance to spot lots of northern Ontario wildlife. Just because it’s cold outside doesn’t mean that residents can’t enjoy a comfortable home. North Bay residents have a new way to upgrade their home without breaking the bank. 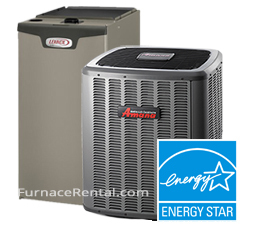 Lower your electricity bills with a new ENERGY star central air conditioner rental. Plus, currently North Bay residents can save even more with the Ontario hydro rebate. More and more property owners are choosing to rent their new high efficiency furnace or central air conditioning unit. It not only makes sense, it actually can make you money.